The International Space Station residents are gearing up to host the Orbital ATK Cygnus space freighter when it arrives Dec. 6. On the ground, a new trio of Expedition 46-47 crew members headed to their launch site at the Baikonur Cosmodrome in Kazakhstan before their mid-December mission. 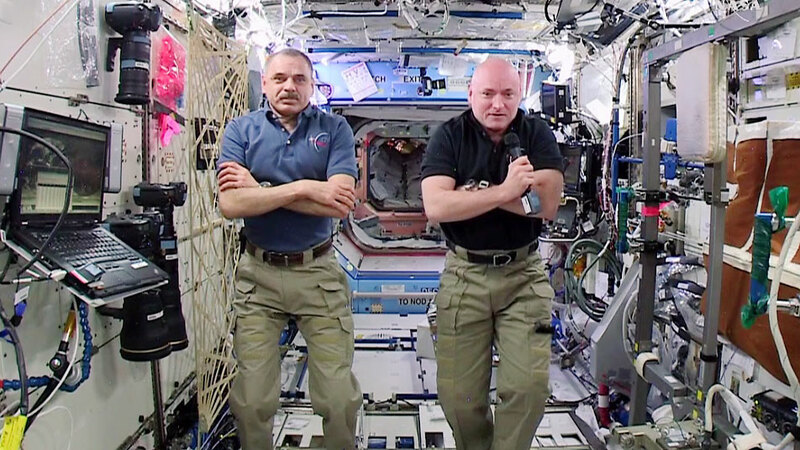 NASA astronauts Scott Kelly and Kjell Lindgren trained for the rendezvous and robotic capture of Cygnus after its Dec. 3 launch from the Kennedy Space Center. The Cygnus will deliver supplies for the crew and new science experiments Dec. 6 when it is captured and berthed to the Unity module. Three new station crew members are in the final stage of their mission training before beginning a six-month mission to the orbital laboratory. First-time British astronaut Timothy Peake will join veteran station residents Yuri Malenchenko and Timothy Kopra inside the Soyuz TMA-19M spacecraft for a six-hour ride to the space station set for Dec. 15. Meanwhile, advanced space science continued today as the crew explored radiation, blood circulation and microbes living on crew members. Scientists hope to use the results from the many experiments on the station to benefit people on Earth and future crews. 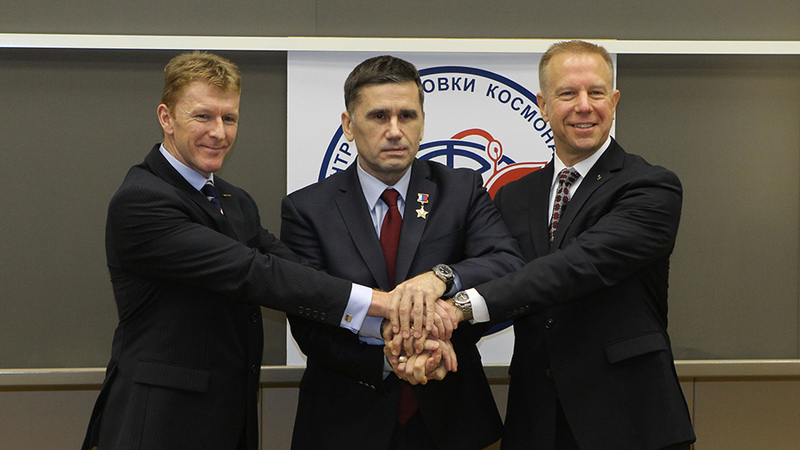 Finally, the crew is packing the Soyuz TMA-17M spacecraft before its undocking Dec. 11. The Soyuz will bring home Expedition 45-46 crew members Lindgren, Soyuz Commander Oleg Kononenko and Japanese astronaut Kimiya Yui. The current space station configuration has two Soyuz crew spacecraft and two Progress resupply ships docked at the orbital laboratory. View the station overview page. Crews and cargo shipments will be coming and going at the International Space Station during a busy December in space. Two resupply ships will arrive, one cargo craft will leave and an Expedition 45 trio will head home before an Expedition 46 trio replaces it. Commander Scott Kelly teamed up with Flight Engineer Kjell Lindgren for more robotics training before the Dec. 3 launch and Dec. 6 arrival of the Orbital ATK Cygnus cargo craft. When Cygnus arrives it will be captured with the Canadarm2 robotic arm and berthed to the Unity module. Meanwhile, Lindgren along with Japanese astronaut Kimiya Yui and Soyuz Commander Oleg Kononenko are preparing for their Dec. 11 landing. On the ground in Russia, their Expedition 46 replacements Soyuz Commander Yuri Malenchenko and Flight Engineers Timothy Kopra and Timothy Peake are counting down to their Dec. 15 launch. A docked Progress 61 resupply ship will fire its engines Wednesday raising the station’s orbit to accommodate the mid-December crew swap. The Cygnus cargo craft is in Florida at the Kennedy Space Center being processed before its early December launch atop an Atlas V rocket. Russia’s Progress 60 (60P) cargo craft will undock from the Pirs docking compartment Dec. 19. 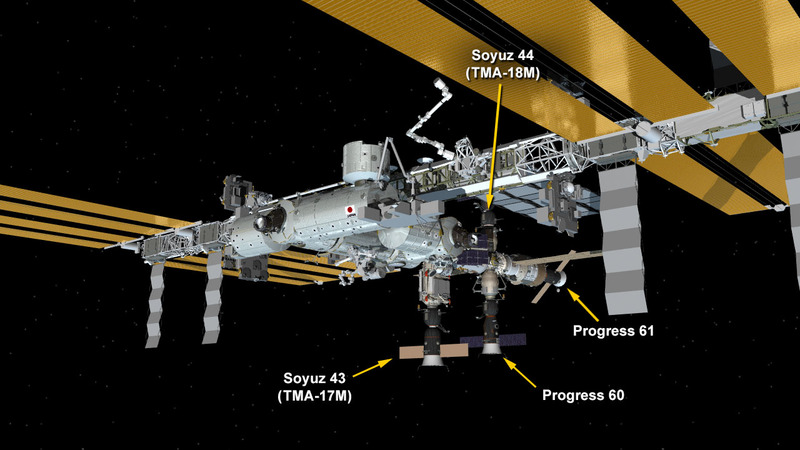 A new Progress 62 resupply ship will replace the 60P when it arrives at Pirs Dec. 23. The next cargo mission to the International Space Station is set to launch Dec. 3 at 5:55 p.m. EST. The Orbital ATK Cygnus commercial cargo craft will arrive Dec. 6 when it will be grappled with the Canadarm2 and berthed to the Unity module. Commander Scott Kelly joined Flight Engineers Kjell Lindgren and Kimiya Yui and trained for Cygnus arrival. They used computer training software and practiced the rendezvous and grapple techniques they will use while operating the Canadarm2 from inside the cupola. The crew was back at work Monday conducting more science to benefit life on Earth and astronauts in space. They explored a variety of subjects including human research, botany and physics. Kelly looked at working with touch-based technologies, explored liquid crystals and tended plants. 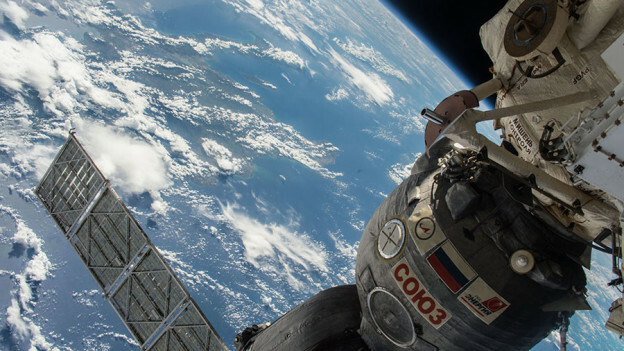 His One-Year crewmate Mikhail Kornienko downlinked earthquake data captured on the orbital lab and stowed trash inside a Russian resupply ship. Cosmonaut Oleg Kononenko researched veins in the lower extremities of crew members and performed a vision test. Flight Engineer Sergey Volkov participated in Crew Medical Officer training and photographed the condition of the Soyuz TMA-18M spacecraft windows. Yui researched intracranial pressure caused by microgravity potentially affecting an astronaut’s vision. He also began a 24-hour data take while attached to an electrocardiogram. Lindgren studied new exercise techniques using gear that measures respiratory and cardiovascular functions. 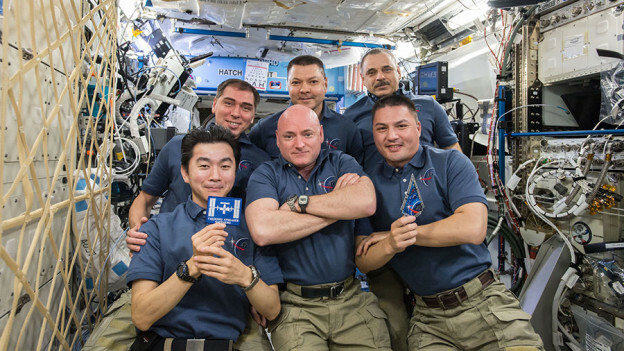 The six-member Expedition 45 crew continued exploring more life science Thursday. Commander Scott Kelly, who is comparing his space-borne body with his ground-based twin brother and ex-astronaut Mark Kelly, collected and stored blood and urine samples for the ongoing Twins study. Flight Engineer Kjell Lindgren explored using a joystick that transmits sensitive vibrations to control a rover on the ground from a spacecraft. Japanese astronaut Kimiya Yui studied the atrophy of skeletal muscle cells caused by the lack of gravity while living in space. Kelly and Yui later partnered up to install and route cables in the U.S. Destiny lab module. Those cables will standardize and increase the efficiency of video, audio and telemetry data links with future crew and cargo vehicles docking to the station. In the Russian segment of the orbital laboratory, cosmonaut Sergey Volkov studied the depletion of calcium in a crew member’s bones. He then joined Oleg Kononenko to research acoustic methods for detecting micrometeoroid impacts on the station. 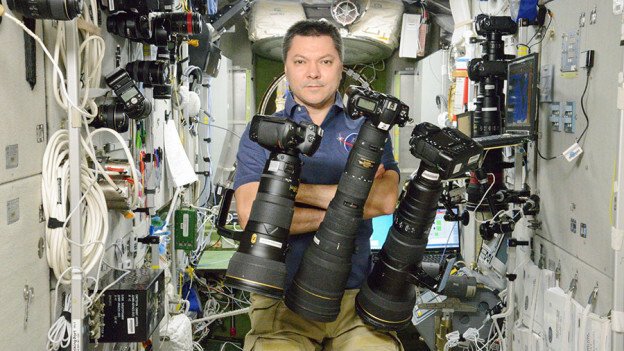 Kononenko also got together with One-Year crew member Mikhail Kornienko to explore microgravity’s effects on the human cardiovascular and respiratory system. At about 2:14 a.m. Central time this morning, a Potential Fire Alarm sensor was triggered aboard the International Space Station and was traced to the European Modular Cultivation System (EMCS) experiment in Express Rack 3 in the Columbus module. The experiment is enclosed and no smoke or fire was detected. Sensors indicated a slight rise in carbon monoxide inside EMCS, while background readings in all surrounding areas remained normal. The crew was never in any danger and the event only lasted a few minutes. As a precautionary measure, Express Rack 3 was temporarily powered down. The rack has since been repowered with the exception of EMCS. There was no impact to station science. The Expedition 45 crew kicked off Tuesday with a wide variety of science exploring how living in space affects humans. The orbital laboratory residents also worked on U.S. and Russian spacewalking gear. Astronauts Scott Kelly, Kjell Lindgren and Kimiya Yui participated throughout the day on Ocular Health studies. The trio subjected themselves to eye exams so scientists can understand microgravity’s effect on crew vision. The three veteran International Space Station cosmonauts conducted their set of Russian space research and lab maintenance activities. One-Year crew member Mikhail Kornienko studied space digestion while Flight Engineer Oleg Kononenko explored how international crews work together on long duration missions. Sergey Volkov, a three-time station resident, worked on repairs inside the Zvezda service module. Kelly and Lindgren were back inside the U.S. Quest airlock putting away tools and cleaning up after a pair of spacewalks in October and November. Volkov and Kononenko were in the Russian segment checking Orlan spacesuits for leaks ahead of a planned spacewalk in 2016. The six-member Expedition 45 crew paused for a minute of silence today in tribute to the victims of Friday’s terrorist attacks in Paris. Flight Engineer Kjell Lindgren bowed his head in the middle of experiment work while Commander Scott Kelly said the crew “was shocked and saddened” by the events. Engineers continued to troubleshoot station systems after 1 of the 8 station power channels went down last Friday. There were no impacts to crew activities, the station maintained orbital control and communications remained in good condition. Ground teams are discussing future repair plans and are currently able to manage the power balance for the foreseeable future. The orbital residents kicked off Monday with the Veggie botany experiment as NASA learns to grow food in space. There were more vision and blood pressure checks helping scientists understand microgravity’s effects on vision. As usual, the crew also continued the upkeep of the orbital laboratory with some plumbing work, battery replacements and cleaning duties. The Soyuz TMA-17M spacecraft is seen docked to the International Space Station. The Expedition 45 crew is wrapping up the work week on biomedical science and Cygnus mission preparations. 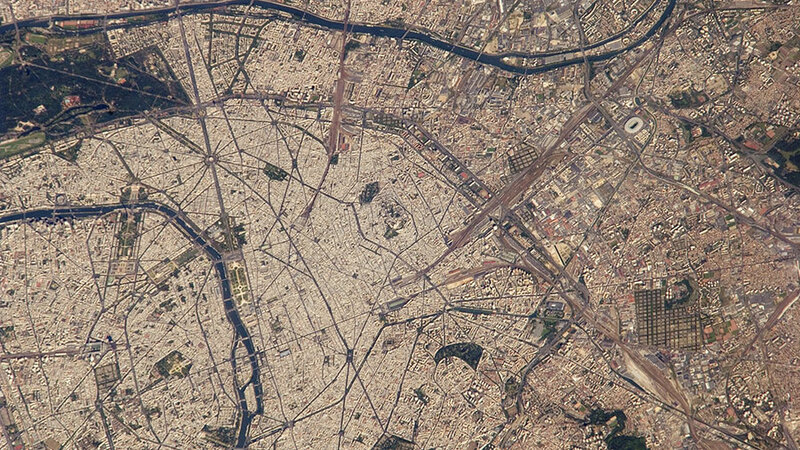 The orbital residents also worked maintenance throughout the numerous modules inside the International Space Station. 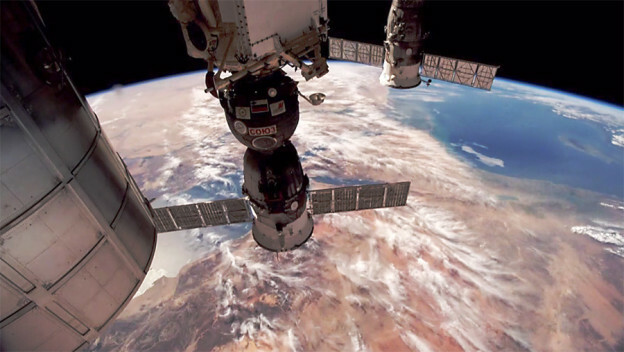 Flight Engineers Kjell Lindgren and Kimiya Yui, who both have been in space over 100 days, checked their vision and blood pressure for the long-running Ocular Health study. Yui then worked on experiment hardware inside Japan’s Kibo lab module. Lindgren explored growing food in space for the Veggie botany experiment. Commander Scott Kelly continued installing gear to prepare for the early December arrival of the Orbital ATK Cygnus cargo craft. He also worked on station maintenance tasks and cleaned his crew quarters. On the Russian side of the orbital lab, One-Year crew member Mikhail Kornienko explored human digestion in space and sampled the station’s atmosphere and surfaces for microbes. Veteran cosmonauts Oleg Kononenko and Sergey Volkov worked in the Zvezda service module to replace a battery and repair overhead sheets. Volkov is the newest Expedition 45 crew member having been in space 70 days. 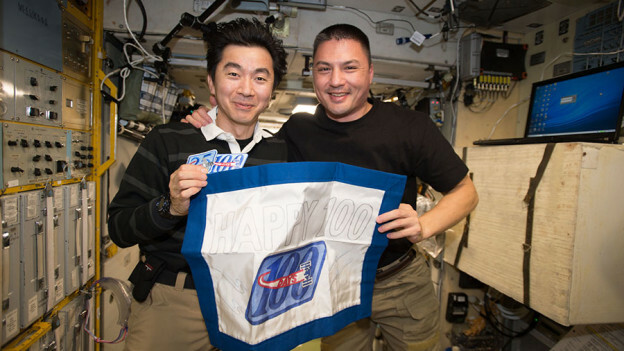 Japanese astronaut Kimiya Yui (left) and NASA astronaut Kjell Lindgren celebrated 100 days in space on Oct. 30. A trio of astronauts are still cleaning up after last week’s spacewalk outside the International Space Station. The cosmonauts are working on their suite of advanced space science and maintenance tasks. Also, the crew is preparing for the launch of the next Orbital ATK commercial cargo mission targeted for Dec. 3. Japanese astronaut Kimiya Yui joined NASA astronauts Scott Kelly and Kjell Lindgren for the post-spacewalk cleanup work in the U.S. Quest airlock. The team stowed their spacewalk tools and hardware and scrubbed cooling loops in the U.S. spacesuits. Kelly and Yui also partnered together to ready the station for the arrival of the Orbital ATK Cygnus cargo craft. The duo reviewed installation procedures for the Nitrogen Oxygen Recharge System scheduled to be delivered aboard the Cygnus. In the Russian segment of the station, three veteran cosmonauts were busy researching a wide variety of subjects and working on Russian station systems. Oleg Kononenko looked at how microgravity affects a crew member’s spacecraft piloting skills. Sergey Volkov explored how vibrations on the station affect experiment results. One-Year crew member Mikhail Kornienko stowed gear inside an outgoing Progress craft for disposal. The Expedition 45 crew gathers inside the Destiny laboratory to celebrate the 15th anniversary of continuous human presence aboard the International Space Station. NASA astronauts Scott Kelly and Kjell Lindgren cleaned up the International Space Station’s Quest airlock over the weekend after completing two spacewalks over nine days. The rest of the Expedition 45 crew started the work week with a series of ongoing science experiments to improve life on Earth and for future crews. One-Year crew member Mikhail Kornienko explored his fine motor skills and studied cardiac bioelectric activity at rest. Cosmonaut Sergey Volkov researched remotely controlling a rover on Earth from the station and worked with fellow cosmonaut Oleg Kononenko on maintenance inside the Zvezda service module. Kononenko also researched the electromagnetic state of the space station and the Earth’s ionosphere. Japanese astronaut Kimiya Yui who assisted Kelly and Lindgren during their two spacewalks took some time off and relaxed Monday with the duo. However, the trio had their daily workouts and collected blood samples for stowage in a science freezer. Kelly also joined Kornienko for interviews with ABC’s “The View” and ITV News.